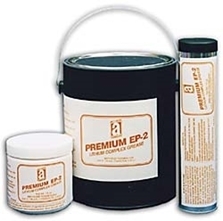 Premium EP-2™ is a Lithium Complex multi-purpose grease, NLGI #2, for use in wide- temperature-range and extreme-pressure conditions. Demanding applications require the use of EP-2 to resist meltdown and leakage. Disc-brake wheel bearings are a good example. EP-2 may be used with confidence at continuous operating temperatures. Precision manufacturing reduces oil bleeding in long-term storage. Its EP properties insure performance under heavy or shock loading. Applications: Bearings, couplings, gears, ball joints, chassis, u-joints, cars, buses, trucks, farm equipment, disc brakes, and many industrial applications.